The brown pack is the Noboribetsu (登別) one. This is a well-known onsen town on the northernmost island of Hokkaido, in a mountainous area. The bath should have a fragrance of the forest, but for me it smelled like laundry detergent. It had a very strong, fresh smell (of a bathroom cleaning product), and while diluting it in much water weakend the scent, it didn’t help much. Will not use again. 1/5. The other one, Nyuto has the same problem, although it has a slighly more hot springy scent. 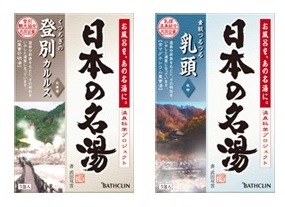 I will give it a try, but I don’t think I will buy any Bathclin products in the near future, and the rest will go to my (poor) friends. Nyuto (乳頭) village is located in Senboku city, in Akita Prefecture (North part of Honshu, Tohoku Region).